The Federal Reserve’s new stimulus measures have had a noticeable impact on market confidence in the dollar and the solvency of our current monetary system. 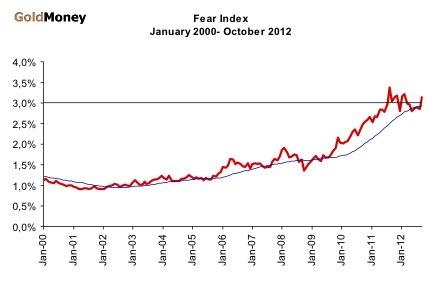 The Fear Index picked up in September and is once more over 3%. The money supply continues to grow at a healthy pace and is picking up speed, adding an average $50 billion every month. More significantly, the gold price rose in September, indicating that concerns about the dollar are growing (though as we saw last month with the Euro Fear Index, worries over the state of the euro are even greater). Nevertheless, these concerns are still at historically low levels: there is still a long way to go until we reach Fear Index levels last seen in the 1980s. The monetary crisis that has been building for the last 20 years – and accelerated with the 2008 financial crisis – is still in its relatively early stages. But understanding of the underlying problems of debt and fiat money has spread beyond a small number of contrarians to a larger number of players in financial markets. Of course the really explosive final stage, when the general public starts to catch on, is still some way off. However, it is extremely important to be prepared before we reach that stage, when it will be far too late and expensive to take the necessary measures. You cannot buy insurance against an earthquake when the ground is already shaking. 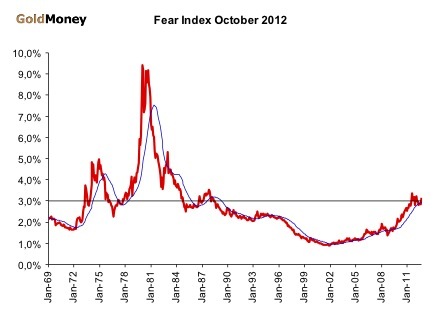 If we zoom in on the last few years we can see that the Fear Index has been trending up from multi-decade lows since 2001-2002. It picked up some speed in 2007-2008 and it has taken a pause for the past year. It now looks primed to resume its climb. Félix Moreno de la Cova Solís studied law and economics at ICADE in Madrid. He is a student of monetary history and Austrian business cycle theory. He analyses and trades equities, commodities and precious metals while also enjoying flying ultra-light aircraft. More on LinkedIn.